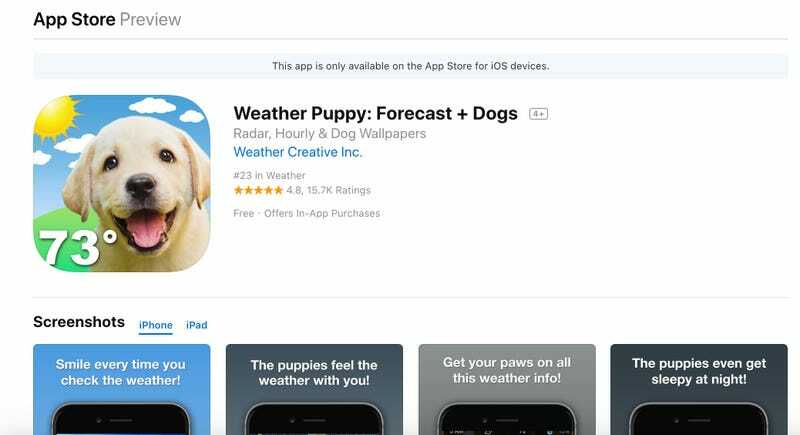 Assorted Reviews Of The iOS Weather Application "Weather Puppy: Forecast + Dogs"
And here are some user reviews. After years of tolerating the Weather Channel app because others I tried didn’t work for me either, I discovered Weather Puppy. I gave it 5 stars despite saying “Almost Perfect” because the two things I would like to see are minor. These are a pollen report and extending the hourly forecast, I have have always found this app to be accurate. I really wanted this APP because I wanted Labrador dogs. This APP promises “NO ADS” if you make IN-APP purchase. I did this and I still see the initial page with advertisements for “Humane Societies”. This can be in the credits under info—not something you have to look at everytime you open the app. They are charging you to have an ads free app and this is not ads free!! !They are not cooperating to resolve the issue. They are saying I have to have a “Black Screen” or these ads while the app is downloading. They can have a photo of a dog or flower. They are saying they are a two person company and I am the only one who complained and the excuses to on and on. I would give this app 4 out of 5. I lost my dog 2 years ago and love seeing the different dogs on your app. Weather is very accurate and like sending the screenshots to my daughter and grandkids to compare our weather...they are in AZ. I expected more pictures of pups in more festive surroundings. Not good enough for the money, should be a better quality. People love their pets!